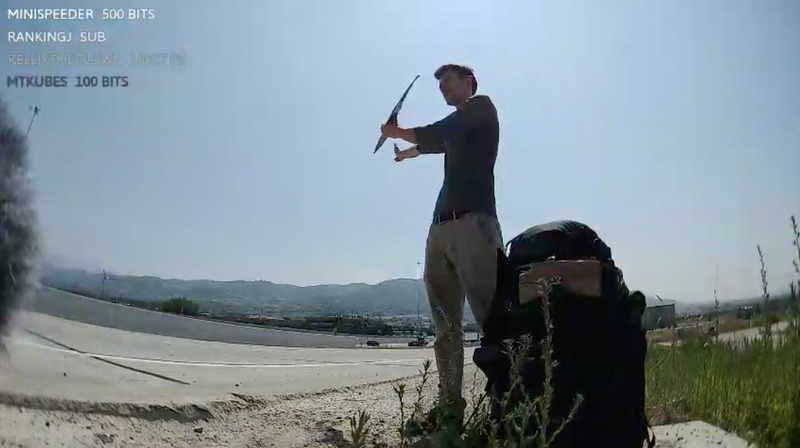 Twitch channel @hitch_liveTrevor Daneliuk waits on the side of a highway for stranger to offer him a ride. Trevor Daneliuk first started hitchhiking about four years ago, when he was still a college student studying accounting. Today, the 24-year-old Canadian has hitchhiked in 25 countries, and says he’s been picked up by generous drivers close to a thousand times. His current trip will take him across all 50 United States – he’s been to 48 at the time of publishing – and is being funded with the money he makes through Twitch, the Amazon-owned video livestreaming service, which he uses to broadcast nearly all of his waking hours on the trek. 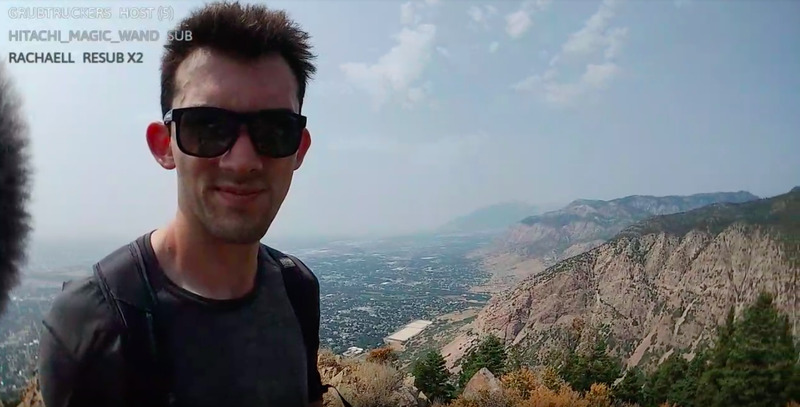 On day 118 of his journey, Daneliuk took a short break from “twitchhiking” (his term for hitchhiking on Twitch) in Salt Lake City, Utah on his way to Las Vegas, Nevada, to talk with Business Insider about his adventures, his online following, and how he got started hitchhiking. 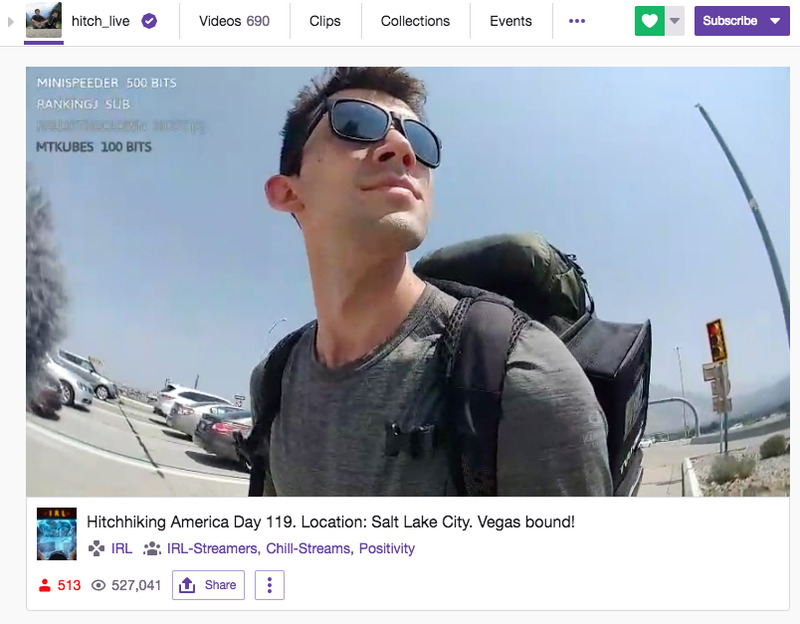 Since beginning his current trip across the United States, Trevor Daneliuk has been using Twitch to live-stream his rides, meals, errands and practically every other moment of his adventure. He has about 700 viewers at a time, on average. 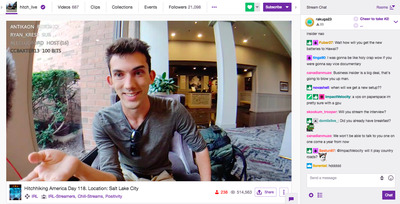 Trevor has roughly 21,000 followers on Twitch, the Amazon-owned live video platform. In recent years, Twitch has become known as a hub for video game streams, and is the virtual home of Tyler “Ninja” Blevins, the best Fortnite player in the world, as well as plenty of other e-sports and gaming celebrities. However, there’s a growing community of streamers on Twitch who don’t post gaming content at all. Daneliuk is one of them. His travel expenses are covered with the money he earns through Twitch. His fans pay a monthly subscription fee, and often donate directly to support his journey. Twitch uses a “cheers” system, which allows viewers to donate money to their favourite streamers with the on-platform currency, called “bits.” The text in the top left corner of Daneliuk’s video feed is a list of recent donations. American dollars are converted to bits at a rate of one cent per bit. It should also be said that getting free rides from strangers isn’t a particularly expensive way to get around. On top of saving on air fare, Daneliuk travels with only what he can carry – while prioritising his heavy streaming equipment – eats fast food for most meals, and often sleeps in a tent on the side of the road. Still, Daneluik said this has been one of his most luxurious hitchhiking trips, and has included more hotel stays than he’s used to, thanks to help from generous viewers. Daneliuk says he first got started hitchhiking simply because he got tired of taking buses from city to city in college, and he says it’s not nearly as dangerous as people might think. Lot’s of people ask him if he’s ever worried about his safety while hitching for rides, but Daneliuk isn’t too bothered by the risks involved. In the thousand or so times he’s been picked up, he says he’s never met a bad person. That said, he’s met a curious cast of characters along the way, including entire families, truck drivers, and two Louisianans dressed as clowns. 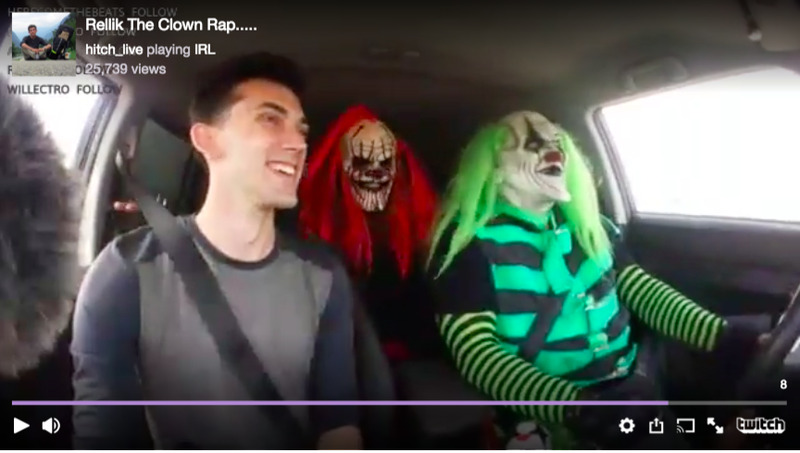 Twitch channel @hitch_liveOn a particularly memorable ride through Louisiana, Trevor Daneliuk was picked up by two men dressed as scary clowns, who freestyle rapped for him to pass the time. On average, Daneliuk says he usually waits for a ride for about 30 minutes. While he’s been picked up by every type of person, he says, most of his drivers are middle-aged men, and they’re rarely ever bothered by the presence of his camera. 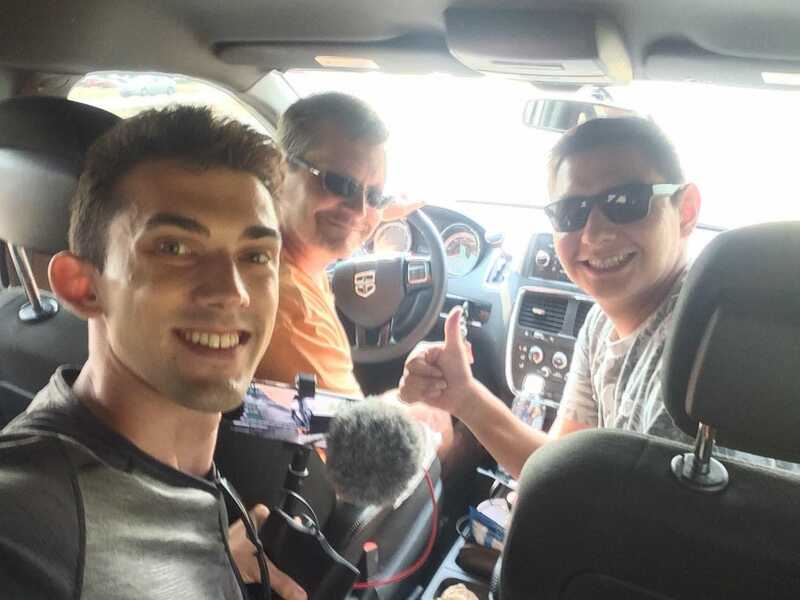 Beyond the excitement that comes with hitchhiking, Daneliuk says that carrying hundreds of viewers around with him has added an entirely new dynamic to his journey. 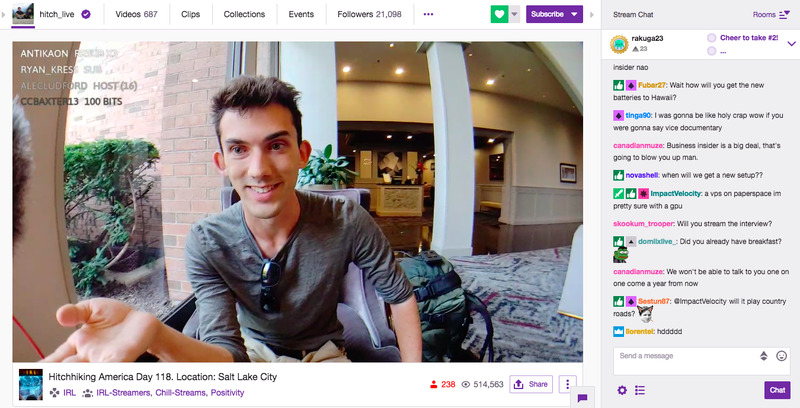 Twitch channel @hitch_liveDaneliuk answers questions from his viewers from the lobby of a hotel in Salt Lake City, before heading out for a long day of hitching. 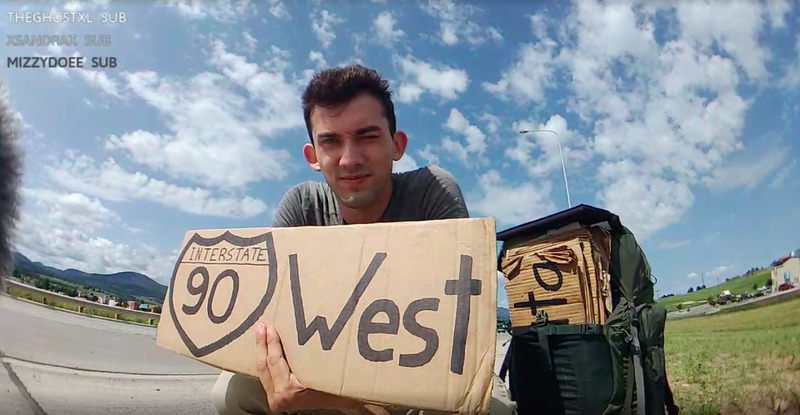 “I wanted to show people what it was like to hitchhike, and wasn’t sure what medium would be best for doing that,” he told Business Insider. 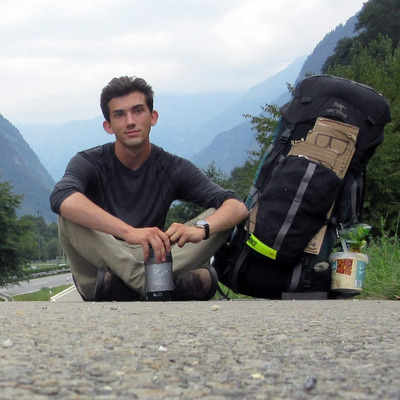 He says he tried journaling and made an effort to shoot and edit videos that would chronicle his journey, but before long he found that at the end of a long day of hitchhiking, his energy was often in short supply and those projects quickly fell by the wayside. “Livestreaming is so simple, you just hit the button to start the stream and hit another button to end the stream and then you have nothing to do at the end of the day,” he said. But the real beauty of the format, he says, is being able to have hundreds of friends with him at all times. Daneliuk is quick to point out that he always asks his drivers for permission to record in their cars, and always turns off the camera in places where recording is prohibited. Trevor DaneliukTrevor Daneliuk takes a photo with his drivers at the end of every ride. Daneliuk’s channel is one of many in the quickly-expanding subgenre of what Twitch calls IRL streaming (Internet slang for “in real life”). Unlike Twitch’s core constituency of video game streamers, IRL streamers take their shows on the road – sometimes literally, as in Daneliuk’s case. They will go to interesting places and talk to people, and generally hunt for content in the real world. The format was popularised by personality-driven channels centered around pranking unsuspecting strangers, or recording people in public without their knowledge. Despite all the challenges of hitchhiking and the demands of keeping up with his thousands of viewers, Daneliuk says that this lifestyle beats the comforts of home. Twitch Channel @hitch_liveOn day 115 of his trip, Daneliuk took a break from hitchhiking to go for a hike in Ogden, Utah. Naturally, he took his viewers along with him. When I asked what his mum thinks about his journey, Trevor laughed, saying she’s very supportive, although it took her a little while to get used to the idea of hitchhiking. She’s particularly a big fan of his streaming career, he says, because it allows her to tune in on Twitch to check on her son whenever she wants. When he spoke with Business Insider, Daneliuk was getting ready to head to Las Vegas, so he could scratch Nevada off his list. Once he does that, he’ll have hit every one of the 48 contiguous United States. The next big challenge, he said, is finding a way to Hawaii and Alaska. 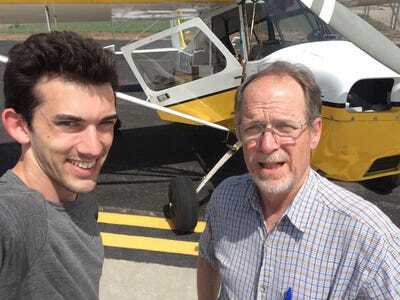 Twitch channel @hitch_liveDaneliuk says he has hitched several plane rides in previous trips, including one with the pilot pictured above. Luckily, Daneliuk says he’s managed to hitch five plane rides before, and is confident he’ll be able to do it again. 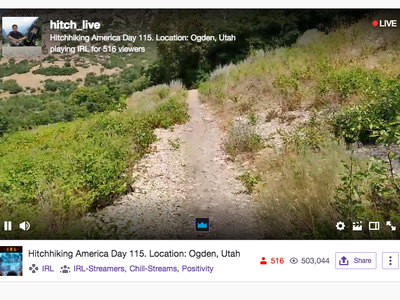 Twitch channel @hitch_liveTrevor Daneliuk went for a hike on a day-off from hitchhiking in Ogden, Utah. When asked what it will be like to finally return home after more than a third of a year, Trevor says he’s looking forward to visiting family and friends, but that he won’t be staying long.